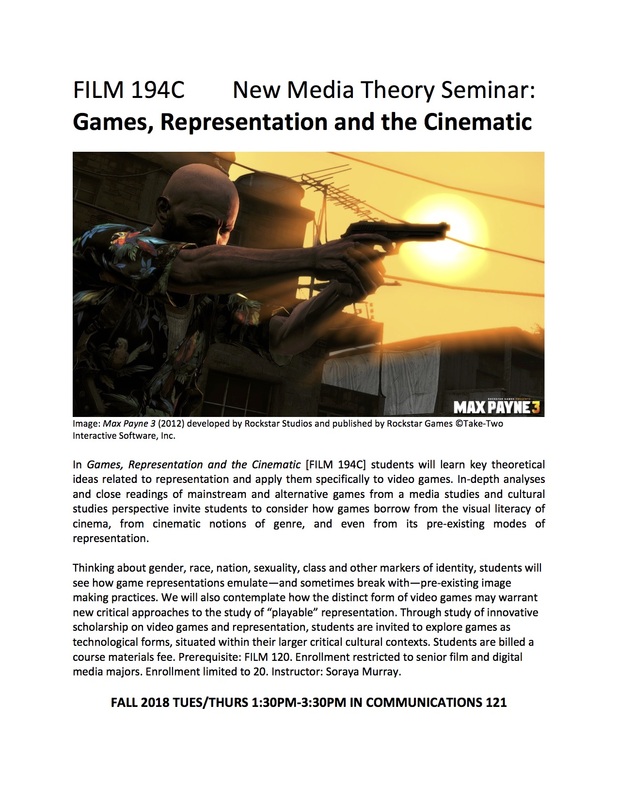 In Games, Representation and the Cinematic [FILM 194C] students will learn key theoretical ideas related to representation and apply them specifically to video games. In-depth analyses and close readings of mainstream and alternative games from a media studies and cultural studies perspective invite students to consider how games borrow from the visual literacy of cinema, from cinematic notions of genre, and even from its pre-existing modes of representation. Thinking about gender, race, nation, sexuality, class and other markers of identity, students will see how game representations emulate—and sometimes break with—pre-existing image making practices. We will also contemplate how the distinct form of video games may warrant new critical approaches to the study of “playable” representation. Through study of innovative scholarship on video games and representation, students are invited to explore games as technological forms, situated within their larger critical cultural contexts. Students are billed a course materials fee.